I know, I know! 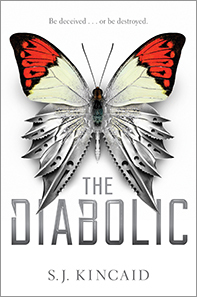 As a "crazy bookworm" it's almost sacrileges to swear off genres, but there have been very few Sci-fi\fantasy's that I have read and even fewer that I have liked, so imagine my surprise when I actually really enjoyed The Diabolic. You couldn't go anywhere on the blogosphere, twittersphere or any other 'sphere without stumbling across the love and raving of this book. Everyone who reads was talking about it. I think that made me even more nervous because usually when a book is that hyped up, it tends to disappoint me in some way or another, but that was not the case this time. Instead, I was proven why this book gained the popularity and following that it did. Simply put The Diabolic is a fast-paced, heart-pounding adventure! What I struggle to find in books that fall under this genre is heart. They seem to be really cold and lack emotion, but that is another area where The Diabolic broke the mold. There are some beautiful emotional notes that make this book so much more than a "robot" story. Kincaid did a wonderful job at creating and delivering this very intricate setting. Weaving together all of the politics and characters to produce a one of a kind world. I am SO glad I gave this book the chance it so deeply deserved. I was transported from my couch into the galaxy, fighting alongside Nemesis. I was taken on a thrilling ride and look forward to continuing this epic adventure! I urge other who may veer away from these types of books to step out of your usual tastes and give something different a try. You'll open yourself up to beautiful new worlds waiting to be discovered by you! I beg for forgiveness for wrongly judging this genre!